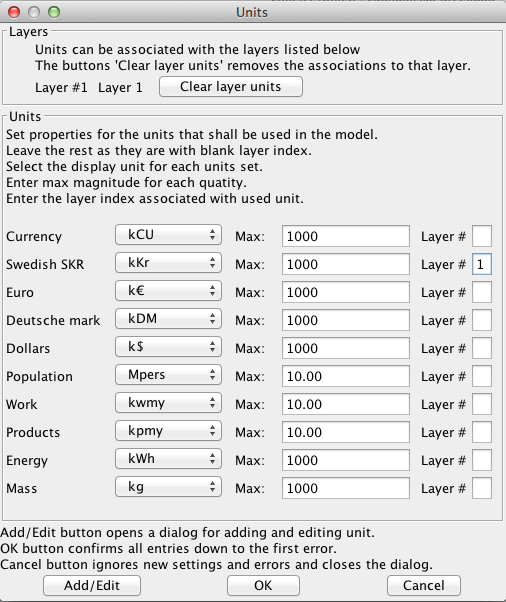 Dialog Box Units is used to define units of the flows in each model layer. The section Layers shows the number of each model layer, in this case the number 1 (Layer # 1) for the layer named Layer 1st There is also a button to delete the reference to the entities that refer to a specific layer. The section Units displays all devices that can be used for feeds. For further Only these units available. Button Add / Edit is for a future feature to add new devices. After the name of each unit is a menu for selecting multiple of the unit. The text box Max: indicates the maximum expected value of the selected variety. This value should be chosen as small as possible. For small value will appear as red flow arrows in this example. max = 1000 KKR, for large value may cause ill-conditioned (intractable) equations that the program can not solve. In the text box for Layer # specified index of the model layer where the device will be used.